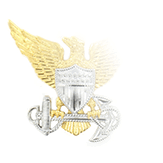 Army regulations allow the wear of tie tacks or tie clasps whenever the four-in-hand necktie is worn (please refer to Chapter 18 Section 20 of DA 670-1 for a description of which uniforms and/or occasions call for the four-in-hand tie). 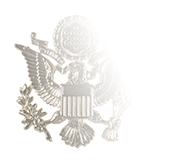 The Master Sergeant E-8 tie tack is an optional purchase item and, as such, is not required to be manufactured from a particular type of metal or using any specific production technique. 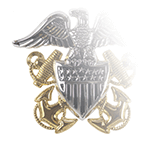 Interestingly, while the Master Sergeant tie tack does display the grade insignia of three chevrons above three arcs, the bottommost chevron and uppermost arc are not linked. 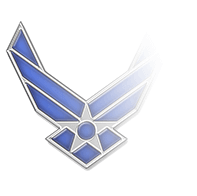 For nearly two dozen years after the rank of Master Sergeant was established in 1920, it alone occupied the highest enlisted pay grade (1). 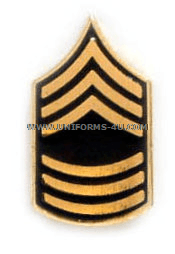 In 1942, however, the Army, realizing the need for more high-ranking NCOs to serve leadership roles in the field, move the rank of First Sergeant into the same pay grade as Master Sergeant, and since that time the two positions have shared the same pay grade—E-8 ever since 1958—but certainly not the same duties. Almost universally, Master Sergeants are the primary Noncommissioned Officer at the battalion level and higher, serving in staff elements rather than exercising direct command over Soldiers. First Sergeants, on the other, exercise can be considered the fulcrum of a company-sized unit, where several areas of responsibilities and types of operations merge. 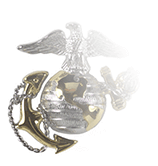 From time to time, a Master Sergeant may be laterally appointed to serve as a unit’s First Sergeant, and in those cases a Master Sergeant may be addressed as “First Sergeant”—until he returns to his old assignment or is promoted (or, heaven forbid, demoted).